Hi, finally OnePlus launched OxygenOS 4.0.3 stock Rom for OnePlus 3T. This is OxygenOS 4.0.3 based Android 7.0 Nougat and here is an easy and safe tutorial for install OnePlus 3T OxygenOS 4.0.3 Nougat Stock Rom. OnePlus 3T has Brilliant 5.5 inch Super AMOLED screen with 1080 x 1920 pixels resolution. This phone comes with superb build quality and innovative design. OnePlus 3T has two outstanding features Qualcomm MSM8996 Snapdragon 821 and Corning Gorilla Glass 4, it’s make this phone very smoother and faster. Recently OnePlus has rolled out Stable OxygenOS 4.0.2 for OnePlus 3T. Added Wi-Fi IPv6 Support toggle. Optimized Smart Wi-Fi Switcher, if turned on, device will switch to data connection if Wi-Fi signal is consistently poor. Increased stability of the Camera app. Optimized exposure when taking night time photos. Updated Audio Parameters and improved the quality of audio recordings. Amazon Prime App will be pre-installed for India Users. If you experience frequent WiFi disconnections, please go to Settings > Wi-Fi > Configure WiFi (Top right hand corner) > Scroll to bottom of the page and check the IP address format (IPv4 = Single line, IPv6 = Multiple lines)> If the IP address is IPv6 based, then turn off the IPv6 Support toggle and see if the disconnections stop. If you experience frequent WiFi disconnections due to switches between WiFi and data, please try turning off the Smart Wi-Fi Switcher at Settings > Wi-Fi > Configure WiFi and see if the disconnections stop. If you still experience WiFi connectivity issues, Thanks. Step 1: Download OnePlus 3T OxygenOS 4.0.3 zip files. Connect your phone to PC and copy the downloaded.zip file into your Phone Internal Storage. Do not copy downloaded.zip into any folder or SD card!! Step 3: Your phone is going to recovery mode. Now select language and click on install from local. 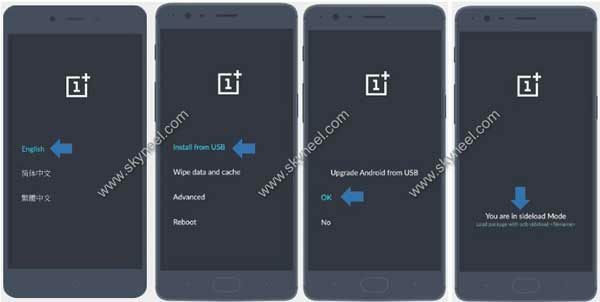 find downloaded OnePlus 3T OxygenOS 4.0.3 zip file and click on. installing process is start. Don’t interrupt this process, it might to take 4-6 minutes. your phone is reboot automatically. Step 1: Download OxygenOS 4.0.3 Zip file and ADB and Fastboot Tool files. After then copy OxygenOS 4.0.3 Rom zip file into ADB and Fastboot Tool folder. After then press and hold shift key in the keyboard and right click in the extracted Fast boot tool folder and select “Open command window here”. See in this image. After Install OnePlus 3T OxygenOS 4.0.3 Stock Rom, you can root your phone because root allows you to use a maximum of your phone without any restrictions. After root you will install custom apps, Rom and custom setting in your phone. But first read Root Advantage and Disadvantage by this article then follow this guide to root OnePlus 3T. 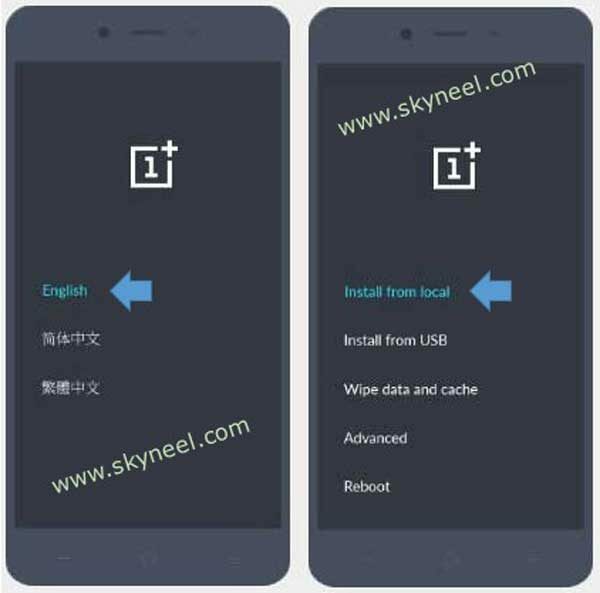 I hope you like this install OnePlus 3T OxygenOS 4.0.3 Nougat Stock Rom installation guide from which you will be able to easily Install OnePlus 3T OxygenOS 4.0.3 Nougat Stock Rom without any extra efforts. If feel any problem in this guide then please use comment box. Thanks to all.